Field-ready: Savage’s 110 Scout, a Leupold VX Freedom 1.5-4x IER Scout Scope, Spyderco’s Bill Moran Skinner, an Alps OutdoorZ Extreme Traverse X backpack and enough Federal Premium 150-gr. SPs for just about anything. Since Scout Rifles first appeared on the radar, I’ve seen a few non-commercial examples ranging from DIY chopped-up surplus bolt actions to spectacular M70 Winchester custom jobs cut for stripper clips, with enough high-dollar man-hours invested to make several house payments. I’ve also seen numerous commercial examples, including the original Steyr, but the new Savage 110 Scout is a pretty good distillation of all the things making this type of rifle viable. Jeff Cooper had as much to do with the development of the Scout Rifle concept as he did with the resurgence of interest in the 1911 back in the 1960s. Cooper’s prototype Scout centered around the no-frills (and sorely missed) Remington Model 600 carbine with its distinctive dog-leg bolt handle and a forward-mounted, long eye-relief scope, backup peep sights and abbreviated overall length and weight parameters. The completed package was supposed to measure a meter or under. Virtually every Scout I’ve ever seen or shot since has been a .308 per Cooper’s original. Although they certainly don’t have to be so chambered, you’d be hard pressed to find any other short-action alternative to equal the .308 in versatility, manageability, and sheer availability. Not to mention efficiency, as we’ve discovered from years of slaving over a hot chronograph. Most .308 factory loads are surprisingly forgiving in terms of velocity loss from short barrels such as the basic Scout rifle. 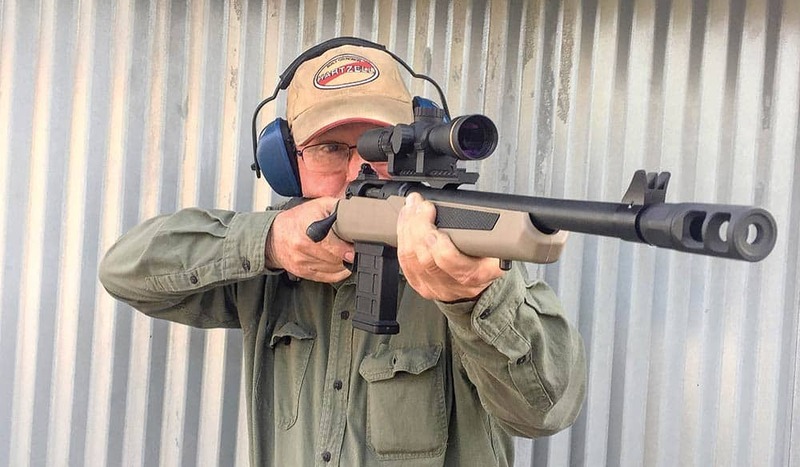 You’d really have to do quite a bit of radical barrel-whacking — dipping into SBR territory — in order to drop a .308 down to .30-30 chrono numbers. A very long time ago I remember bending an old gun-geezer’s ear about some new hot-rock 7mm blaster. He listened patiently, then advised me in no uncertain terms to never forget one thing: America is a .30-caliber country. It’s debatable whether this is still true or not in our current “AR Age” but the new and upscale Savage 110 Scout .308 makes a pretty powerful case for this sentiment. As far as the rifle itself goes, there’s never been any shortage of specialized platforms and calibers to surpass it in range, rate of fire, and the ability to punch teeny-tiny groups, but those things aren’t the point of this gun. The Scout is supposed to be a general-purpose tool, although Cooper’s original concept of military-type reconnaissance applications have — in lieu of a Doomsday scenario — given way to sporting/hunting uses. In spite of beliefs to the contrary, “general-purpose” can be a good thing. A trapper-pattern 3-bladed pocketknife may not be the best tool for cleaning fish, self-defense, skinning a deer and shaving sticks to start a fire but it can accomplish all these things if pressed into service. Not to compare a Scout Rifle to a pocketknife but for real-world applications, the Scout will probably do about 99 percent of what anyone who buys a “serious caliber” centerfire rifle wants to do. The usual knock about multi-use tools of any stripe is they “do a lot of things adequately, but not one of them superlatively well.” Honestly, isn’t this a kind of elitist complaint for most folks? After all, who really needs a quarter-minute rifle, or a 1,000-yard rifle, or a rifle capable of handling Africa’s Big 5? Of course, there’s been considerable back-and-forth about the actual dimensions of a “true” Scout Rifle but the Savage 110 version will probably make even the most adamant purist happy. Barrel length is 16.5". The overall length — depending on which of the supplied spacers you select for the synthetic, Flat Dark Earth AccuFit stock — is between 37.5" and 38.5", which keeps it just under Cooper’s initial 1-meter mandate. Weight (unscoped) is 7.7 lbs. and it comes with a synthetic 10-round detachable magazine as well as forward-mounted Picatinny rail, adjustable height of comb inserts and a fully adjustable rear peep sight. The front sight is protected by ears and beyond it there’s a large muzzlebrake. Of course, the gun is outfitted with the excellent Savage AccuTrigger. 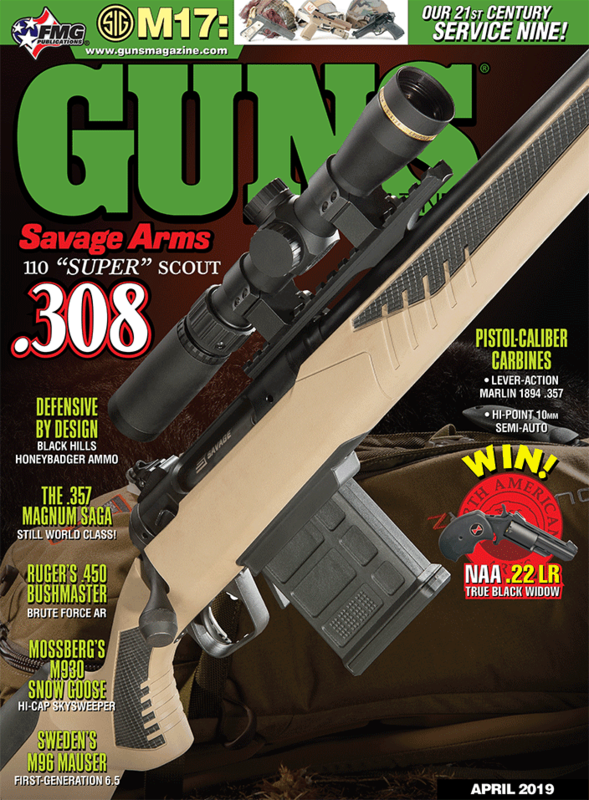 Savage’s 110 Scout is a refined version of Jeff Cooper’s Scout Rifle concept. Left: Just for fun, Payton yanked the scope off and tried the aperture sights at 50 yards with a fairly rapid 5-shot string using Federal American Eagle 150-gr. FMJs. Middle: Yes, it shoots: This 3-shot group at 100 yards was courtesy the Black Hills 178-gr. A-Max. Right: At 200 yards, Federal Premium 168-gr. Tactical Tip MatchKings again showed the rifle’s preference for the upper end of the bullet weight range. What earlier Scouts by other makers didn’t have was the company’s recent AccuFit stock system. Snap-on stock spacers and cheekpieces allow you to tailor the 110 to varying physiognomies and dimensions. Anyone — short of a Barnum & Bailey attraction — should be able to get this rifle “just right.” Realistically, for the one-gun guy, what’s neat about the LOP adjustment is this: You can shorten it for winter hunting with a heavy coat on. The weight of the gun scoped and with a fully loaded magazine aboard is going to be somewhere near 8.5 lbs. For a “blast from the past” comparison, a scopeless, unloaded Winchester M94 Carbine scales nearly 2 lbs. less. The AccuFit System allows you to tailor length-of-pull as well as comb height with an array of easily switchable inserts. When it came time to shoot, I selected a democratic assortment of loads accumulated over the past year or two, trying to work in target, hunting and “tactical” law enforcement numbers. They included Federal American Eagle 150-gr. FMJ, Federal Premium 168-gr. Tactical Tip MatchKing, Speer 150-gr. LE GDSP, Browning BXR 155-gr. Matrix Tip and Black Hills 178-gr. A-Max. The relatively short 16.5" barrel exacted a reasonably light velocity penalty — .308s are nice this way. The chronograph numbers looked like this: American Eagle 150s (2,650 fps), Federal Premium 168s (2,560), Speer 150s (2,708), Browning 155s (2,620) and Black Hills 178s (2,520). In terms of accuracy, the heavier stuff won out — the two top contenders were the Federal 168-gr. and Black Hills 178-gr. Both held 3-shot groups between 1/2 and 3/4" at 100 yards. The lighter stuff ran from 1-1/4 to 2". At 200 yards, both of the heavier loads were around 2", which is about as well as we can do with a 4X scope with “Scouty” eye-relief measurements. Of course, I couldn’t resist yanking the scope off to try my hand with the aperture sights. I discovered you don’t absolutely have to remove the rail to use them but keeping it in place does tend to confuse the sight picture, particularly in conjunction with the protective front sight “ears.” Five shot groups at 50 yards were done just as fast as I could rack the bolt and line up the sights. The best efforts were in the 2" to 3" range and owed as much to the AccuTrigger (which weighed a very nice “unadjusted” 3-1/2 lbs.) as to the irons themselves. Of course if you’re going to take the backup irons seriously, you’d best zero them with as much care as you would the scope. I’d feel pretty confident with them at 75-100 yards or so on hogs or deer and they beat the hell out of the old buckhorn sights on a traditional levergun. However, I’d want the scope rail gone if I decided to use the irons and I’d be darn careful about lining up one of the front sight ears instead of the center blade. This latest incarnation of Cooper’s concept is a fine-shooting rifle. If I could have one wish granted, I’d ask for an optional 5-round steel magazine. The synthetic 10-rounder the rifle comes with strikes me as a bit unwieldy and it also made shooting groups off a sandbagged rest kind of a drag — which is why I often resorted to single-loading. Incidentally, the 110 Scout was very pleasant to shoot as recoil was surprisingly light. The efficient recoil pad, substantial gun weight and effective muzzle brake obviously worked well in concert. The MSRP is $819, which puts it on par with the “store-bought” competition. The verdict? It’s a stylish, great-shooting rifle combining handiness with a distinctive look. I think it would make an excellent hog or whitetail gun.